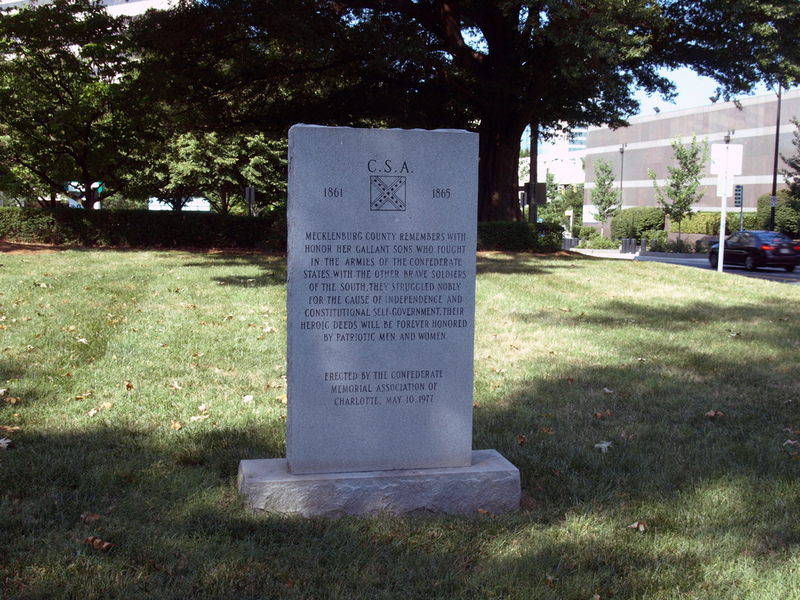 Confederate Memorials – Stay or go? I’m sorry that I haven’t done a blog entry in a couple of weeks – I hope that this will get you to think. I normally don’t get into current events on this blog, but with the events in Charleston last week and the current debate about the Confederate Battle Flag and Confederate monuments and its place in public spaces I thought I would weigh in on the debate. There are some small ones in the Center City – one talks about where Jefferson Davis was when he heard about the assassination of President Lincoln and another one designates the location of where the Confederate Cabinet had their last meeting before Appomattox. Both of these are on private property on South Tryon Street. The ones that are raising a stink here are located on City and County property. 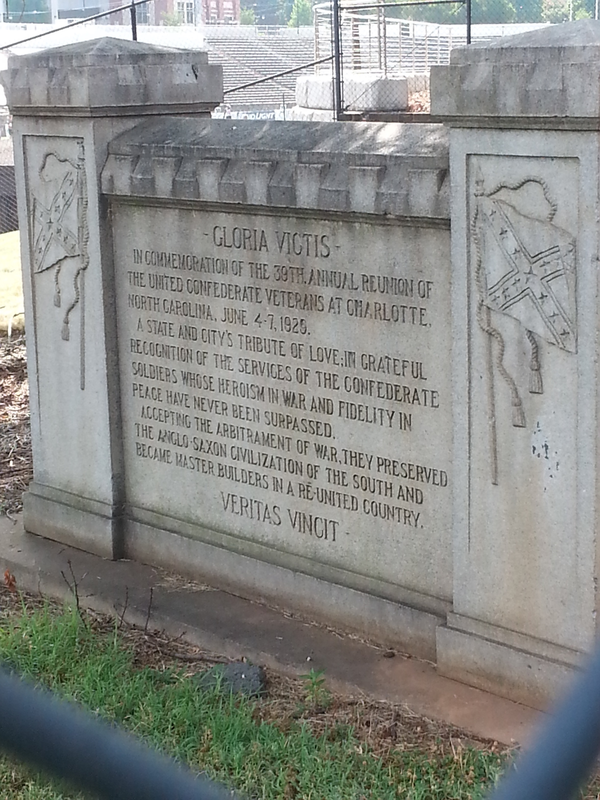 Confederate Veterans Marker at CPCC. Photo taken by the author. All of these monuments are on either city owned or county owned property which is owned by the public and paid for with tax dollars. Now the current debate is whether or not they need to stay on public property or not. While I feel that they do not need to be in places such as the Old City Hall and Central Piedmont Community College, they don’t need to removed all together. 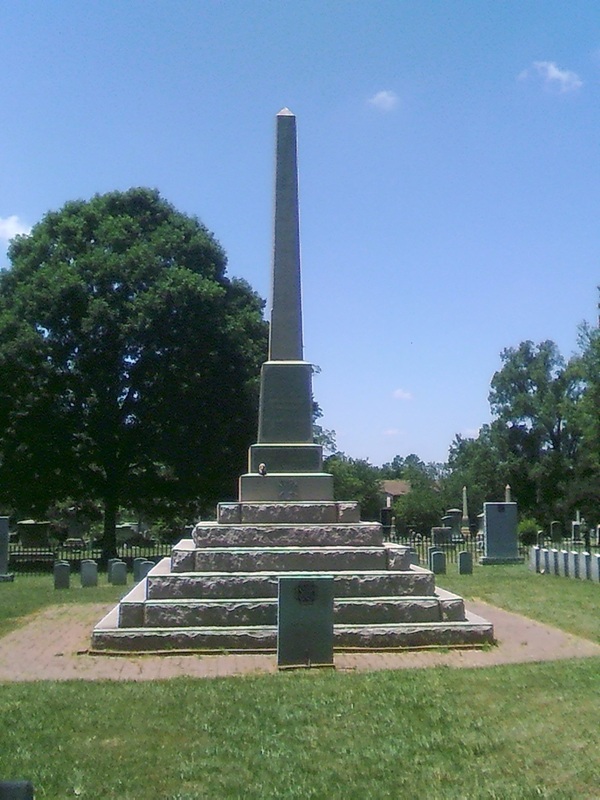 In my opinion, the perfect place for these monuments is Elmwood Cemetery which is owned by the city, but has an established Confederate Memorial at the graves of those who fought in the war and was buried there. This way, it is out of sight of those who really don’t need to be reminded of slavery and the war and has easy access for those who feel the need to honor a time where brother fought brother. And if you really think about it, those that voted for succession were really traitors to the United States and because of the war and its aftermath, an entire region was decimated both politically and economically and an entire generation of men were killed or wounded. Still Fighting the Civil War and America Aflame by Dr. David Goldfield. Both of these can be ordered on-line via Amazon or locally at Park Road Books. Monuments to the Lost Cause – Women, Art and the Landscapes of Southern Memory by Cynthia Mills. Ghosts of the Confederacy – Defeat, the Lost Cause and the Emergence of the New South by Gaines F. Foster. While I certainly understand the still strong opinions regarding the Civil War, I also understand that it will never be fought again, at least not for the reasons it was originally fought for-the freedom of African-Americans from the hideous practice of slavery. For me, that is the reason that monuments remembering this chapter of our history should not be removed. Maybe by seeing/reading the dedications of various Civil War monuments, folks will realize just how far we as country have come since those days.